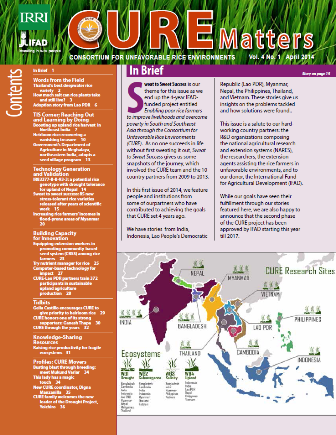 It is the challenges to farmers that define the stress-prone rice environments in Asia. Drought, flooding, and soil salinity are among the many problems that can overwhelm resource poor farmers in Asia's unfavorable rice environments. The unpredictable conditions make farmers' decision-making not only difficult but also information-intensive, and the outcomes of these will affect their food security and overall livelihood. 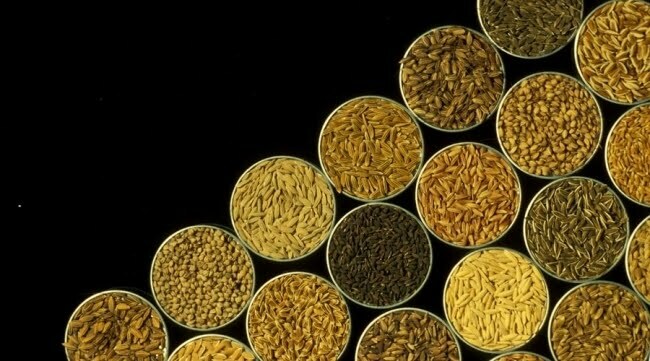 CURE aims to contribute to efforts to improve food security, reduce poverty, and maintain the natural resource base by developing and disseminating technologies that have short- and long-term economic, social, and environmental benefits to low-income rice farmers and consumers. 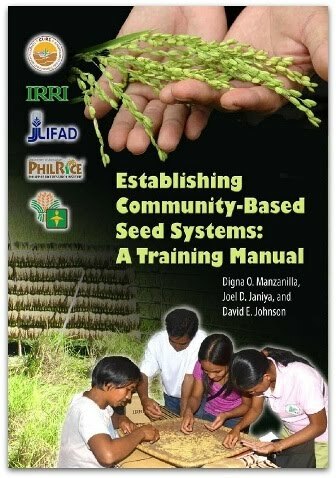 These include improved rice varieties, best management practices, participatory processes, and other relevant information. CURE works with plant breeders to uses modern scientific tools to combine popular local varieties with “stress tolerance traits” to arrive at an improved product that can provide better yields. One good example is Swarna-Sub1, a submergence-tolerant variety developed through considerable “upstream work” using molecular tools to identify the tolerant gene Sub IA and transfer it to Swarna, a popular variety in South Asia, using “marker-assisted” breeding. This process has reduced the time required to bring new varieties to farmers from the normal 6 to 10 years to about 3 years. View the list of released stress-tolerant varieties. Through field days, CURE partners allow exchanges among farmers that enable them to choose from different varieties whose visible performance in the field they may use to compare traditional varieties. Given a number of choices, they are able to take away a selection of good-performing varieties for testing in their own fields. Farmers tend to use seeds from their own harvests. This practice affects the quality of their seeds and the quantity of their harvest. Upholding the principle that seed quality affects harvest, CURE has introduced the concept and practice of clean and healthy seeds, lower seeding rates, and raising quality seedlings. Crop Establishment Methods. CURE facilitates the validation and dissemination of crop establishment methods that are suitable for rice environments that are prone to drought, submergence, and salinity as well as those in the uplands. In the drought-prone area of eastern India, for instance, farmers are convinced that the dry-direct line seeding is proven to be effective and that in years of favorable rainfall, wet-direct seeding can raise productivity for the range of climatic conditions in Chhattisgarh State. Direct-seeding of rice can offer advantages, compared to transplanting, provided that weeds are adequately controlled. These include earlier rice establishment and harvest; better crop growth, and less labor and hence less cost. Early harvests may in turn increase the opportunity for growing post-rice crops, such as chickpea, maize, or potato, provided that late season soil moisture is available. In food-insecure environments, enhanced and diversified cropping systems are highly desirable and this is an important component of CURE’s approach. With shorter-duration varieties and time-saving crop establishment, it becomes possible to grow non-rice crops, which brings cash and employment. Patterns of Labor Utilization. Labor is the largest input that farmers invest in rice production. With improvements in management practices, farmers can look forward to less labor-intensive and high cost of production in establishing a crop.